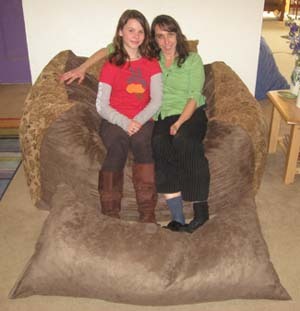 One of our more popular pieces, Nesting Loveseat & Chair Sets are free standing, durable, comforting solutions for kids and adults with autism, Asperger's syndrome, fibromyalgia, lupus, and many other physical disabilities and special needs. 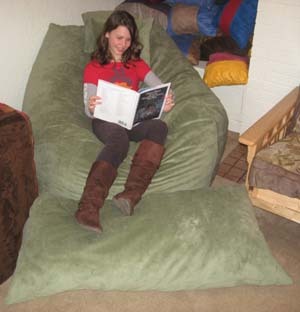 The Nesting Loveseat measures 34” x 34” x 54” and includes a 22" x 50" ottoman and two matching 16” x 16” head pillows, the Nesting Chair measures 34” x 34” x 34” and includes a 32" x 32" ottoman and two matching 16” x 16” head pillows, and the Mini-Cube Nesting Chair measures 30" x 30" x 30" and includes one matching 16" x16" head pillow. The added size of the Nesting Loveseat also allows it to be used individually as a large chair or sideways as a loveseat for several! Nesting Loveseat & Chair Sets are made from stain-resistant, sturdy microfiber or premium velvet fabric and are filled with our special cut foam, which creates an air and foam combination to offer a unique supportive, secure and comforting sensation... like a firm warm hug! The suede like feel and soothing primary colors of our microfiber and velvet fabrics are very pleasing to the senses and go well with any environment. An exterior fitted covering cap is also available as an extra layer of protection, which can also have a water-resistant liner upgrade to the seat area. Nesting Loveseat & Chair Sets are a very safe solution to your furniture needs, there are no sharp corners or wood to be injured on as with other furniture. 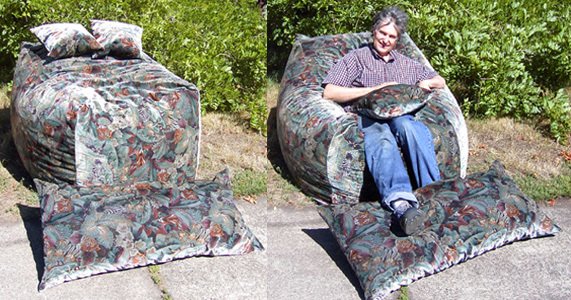 Nesting Loveseat & Chair Sets are the perfect solution to your special needs! A Nesting Chair Set show in brick microfiber fabric with a sky blue fitted covering cap. 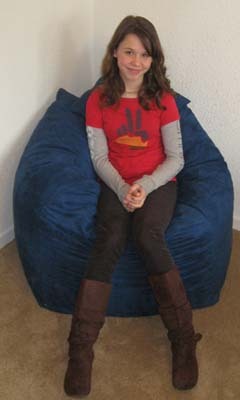 See what our customers have to say about the revolutionary Hug Chair! 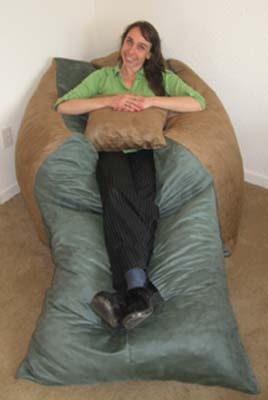 The Hug Chair can also be vacuum packed for quick shipping and a great surprise! 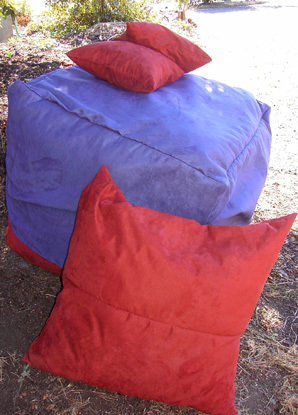 A Nesting Loveseat Set shown in Cafe Microfiber and a special order fabric used sideways as a couch for two! A Nesting Loveseat Set in Spring Green Velvet Fabric used as a chair for one!